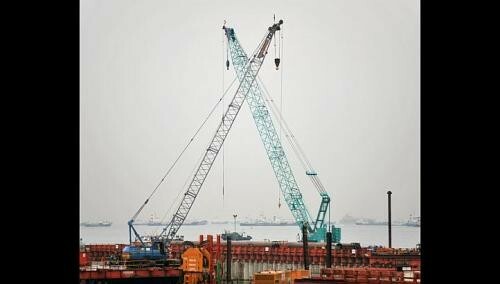 More than 1,200 Singaporeans have stepped forward to inquire about being crane operators, National Development Minister Khaw Boon Wan said yesterday. The "overwhelming response" - which was revealed on his blog - came two months after he bemoaned the lack of locals willing to do the job. But although more citizens have been inquiring, Singaporean crane operators remain in short supply. In May, Mr Khaw pointed out that only half of the 3,600 people doing the job here were local. Although crane operators earn between $2,000 and $7,000 a month, Singaporeans are put off by the risks and perception that it is blue-collar work. Mr Khaw's comments came amid a ramp-up in the Housing Board's Build-To-Order scheme. "A few hundred more" Singaporeans were needed, he said then. Coverage of his remarks appears to have led to some supply trickling in. The Building and Construction Authority (BCA) runs a crane operators' apprenticeship programme, which puts trainees through a sponsored 12-day course and pays them $3,000 over six months when they start the job. It is already at full capacity with more than 60 would-be operators signing up. Trainees work on a crane simulator, giving them hands-on knowledge, said Mr Khaw. "In view of the increased demand, BCA is talking to industry firms so that there are more training providers which can set up additional training facilities," he added. Meanwhile, construction companies have stepped forward to recruit local crane operators. For instance, Straits Construction executive director Kenneth Loo employs 28 of them and is on the hunt for more. About 50 companies have registered an interest in taking part in the Crane Operator Apprenticeship Programme. This could result in about 100 job vacancies involving three types of crane. Tower cranes, up to 300m high, are used to build tall buildings. Crawler cranes move on tracks and are used for drilling, while mobile cranes move on roads and are for general lifting. BD Cranetech director Jeffrey Lim said the shortage of locals can be traced to the possible dangers involved in the job and the perception it is blue-collar work. For instance, tower crane operators must manually climb to the one-person cabin near the top, where they sit in isolation for a shift lasting eight hours or more. "Educated locals might look down on such menial work, even though these are the highest- paid blue-collar jobs around," said Mr Lim. "But what the Government is doing now is necessary. If you don't change the perceptions and attitudes now, it will be harder to do so in future." Guan Chuan Engineering's Mr Raymond Lim was a courier before becoming a crane operator. "What I treasure most about this job is the stability," said the 30-year-old. "The pay is not too bad either."